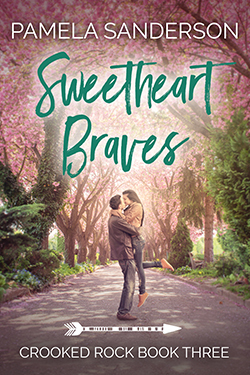 Sweetheart Braves is available now! The future of the Crooked Rock Urban Indian Center remains uncertain. If you somehow managed to make it this far and you haven’t read Book 1 or Book 2 — sorry, this is not a standalone. You’ll enjoy it more if you read at least one of the other books first. Links and blurbs here. What readers are readers saying about earlier books? “Still haven’t had time to read one.” — Pam’s sister, Erin. “I kept reading because I love the characters.” — Pam’s friend, Kira. “I love these people.” — Pam’s friend, Maggie. “The first kiss scene is PERFECT.” — Pam’s cousin, Jennifer. Why not join the mailing list for info on future releases? Free Crooked Rock Prequel story about Linda and Arnie, Not Your Mascot, is available when you sign up. Don’t worry, your email won’t be shared and I only send it out once or twice a year so you won’t dread seeing it.